JULES RSVP set for the Jules Wedding Invitation. All recycled and treefree paper. A1 also called 4 bar size (5"x3.5") RSVP card is khaki tan 100% recycled cotton and silk rag paper. RSVP envelope in Ecru 100% cotton envelope made by Crane in USA. If you are printing, you get 4 cards on the sheet we send you. (Templates included). Paper is cut to size if we print for you. Milkweed 100% postconsumer recycled paper cardstock. 105 lbs weight and 8.5x11 inches. You can print 4 direction cards or reception cards on a sheet. Khaki colored cotton rag cover printed with our big flower in orange. Silk fiber runs through the handmade paper. Perfect for a rustic and green wedding. Treefree? Yes. Recycled, too. Diecut and scored cover, with a handsome pocket for rsvp set or enclosures. Booklet style invitation sheet - perfect for 2 language wedding invitations, or use the left side for a favorite poem. This is a DIY assembly kit. We can print for you, or you can print laser or inkjet. PLEASE NOTE: You cannot take this paper to a photocopy service type printer. All handmade papers, which print desktop perfectly, but can give commercial printers a hard time if they don't have experience with handmade paper. The papers can also be letterpress printed. 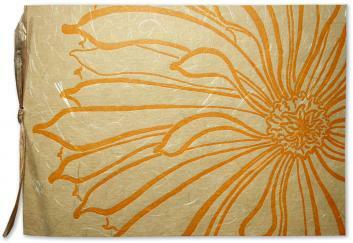 Modern landscape design with bounteous flower letterpress printed in light orange ink. Matching cotton and silk paper invitation sheet. Bound with natural colored paper raffia. PAPER FACTS: Portfolio wrapper made from recycled cotton rag and silk handmade paper from India. Diecut and letterpress printed here in Pasadena. Inside invitation sheet made from recycled cotton rag and silk handmade paper. Envelopes are 100% cotton made by Crane in the USA. Colors: Khaki tan, copper/gold. and ecru. Invitation Sheet:Cotton rag handmade paper. Prints laser or inkjet. Invitation Wrapper:Handmade paper booklet - diecut and scored. Letterpress printed original artwork. Envelope: Ecru 100% cotton A7 standard size. Tie:Half yard of brown/gold paper raffia.